Recommended for all flooring types, the Miele C3 Complete Brilliant is Miele’s most advanced vacuum cleaner. 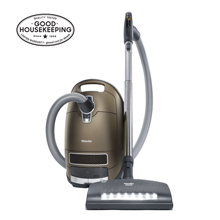 The flagship Miele C3 Brilliant, combining the C3 series’ convenience and exceptional performance features with Miele’s powerful SEB 236 premium powerbrush and luxurious finishes, is possibly the best canister vacuum cleaner Miele has ever made. Designed, engineered and built in Germany, the Miele Complete C3 UniQ vacuum cleaner is lighter, quieter and offers improved cleaning performance over its predecessor, the Miele S5. The Miele Brilliant includes the SEB 236 Electro Premium powerbrush with headlamp, the wide 400-3 Parquet Twister hard floor brush and the combination 285-3 Rug & Floor tool, so you have the right tool for any floor surface. Suction controls on the handle make it easy to choose the setting you need. Or use the Automatic setting that picks the best setting for optimum cleaning and energy usage, even as you move from one surface to another. With its HEPA filter and the patented AirClean Filter Bag integrated into Miele’s Sealed System, the Miele Brilliant traps 99.9% of lung damaging particles in the machine. The Miele Complete C3 Brilliant also features Silence System Plus that combines a new encapsulated motor and integrated insulation to make the Miele C3 exceptionally quiet without sacrificing power. A 3D velvet bumper wraps around the Miele Brilliant to protect furniture, walls and the vacuum itself. An on-board storage compartment holds the crevice nozzle, upholstery nozzle and dusting brush. The extra-long cord with one-touch automatic rewind helps give the Miele UniQ vacuum an exceptionally wide 36-foot cleaning radius. Warranty: 10-year suction motor; 10-year casing; 5-year all non-wearing components.